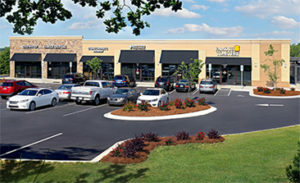 Description: 10,000 sf of retail inside Edgewater Corporate Park houses The Famous Toastery Cafe with outdoor seating, Edgewater Dental (Heartland Dental affiliate) on end caps with boutique Pharmacy and Chiropractor Office. Scope of Work: Investment Analysis, Site Selection, Brokerage, Development, Leasing, Property Management. Brokered: Jan Ringeling/Remax Executive; Developed by: Moody Development; GC: Cummings Construction, Leased by: Katz & Associates, Property Manager: Tonia Cox, Vantage Realty.